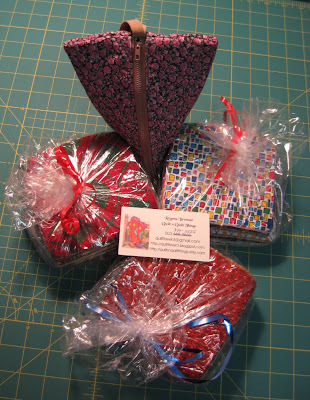 Hooked on Needles: I'm a winner! 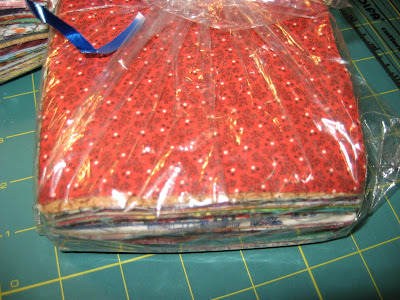 Regena over at Quilt n Quilt Things was giving away three packages of charm squares that she cut from her stash. She also included in the package this super cool triangle shaped zipper pouch. 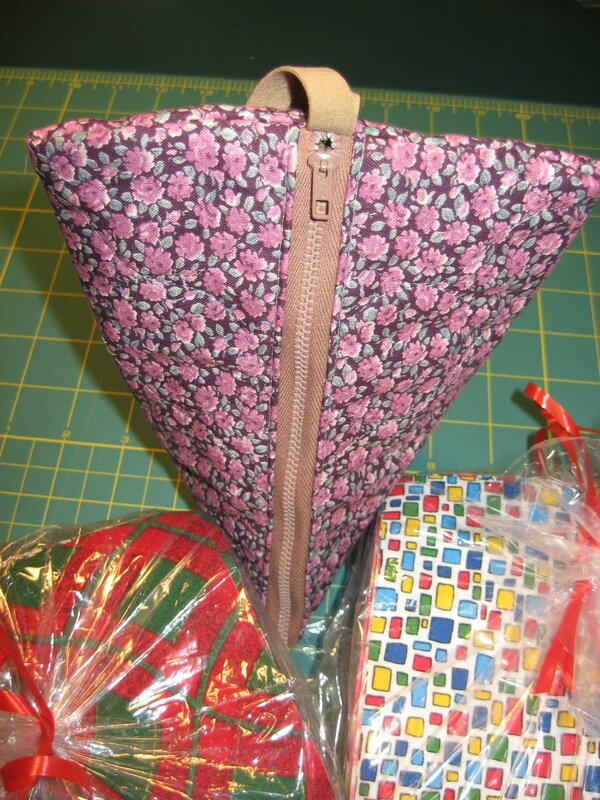 I love little pouches like this for holding all sorts of odd things. It's a nice size and it even has a handle! 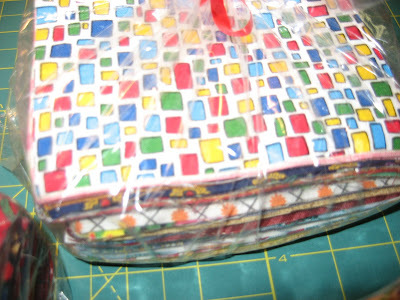 One of the packages looks like it might be all Christmas fabric squares. 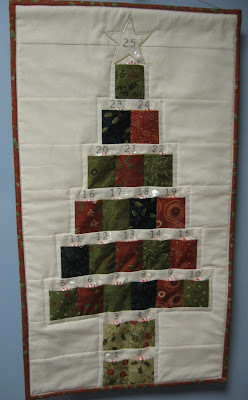 This is exciting to me because I am in the midst of doing sewing projects for Christmas and having a large variety of different fabrics to choose from while working on small projects can make them so interesting and festive. The next package looks to be a collection of bold designs. 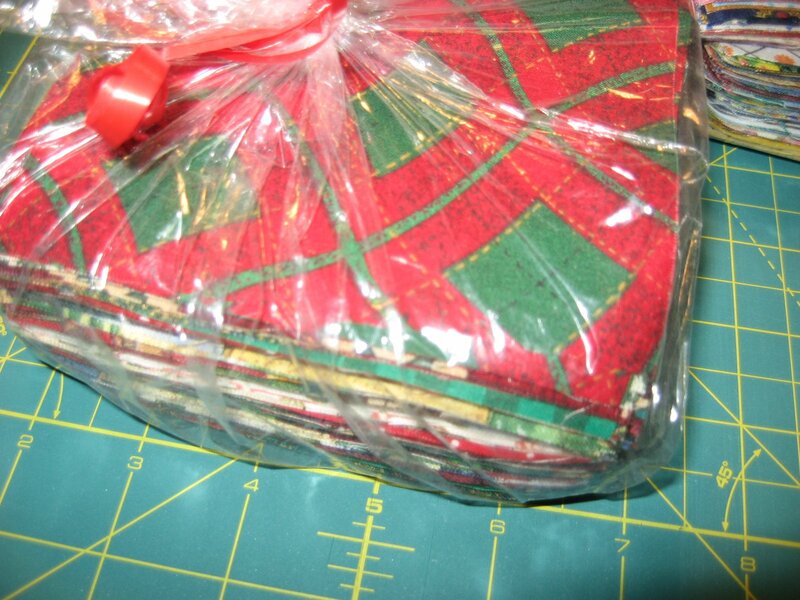 These will make great baby quilts. And this third package looks like it might be an assortment of smaller print. There must be hundreds of blocks in each package, so I should be able to make all sorts of fun and useful things with them. Thanks, Regena! 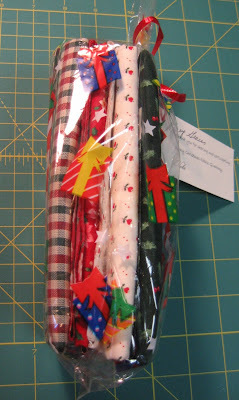 ...just in time for the Christmas projects I hope to be working on soon! Thanks Nola! Just as I was ready to publish this yesterday, George the mailman arrived with a package for me from Christine Mitchell up in Canada. 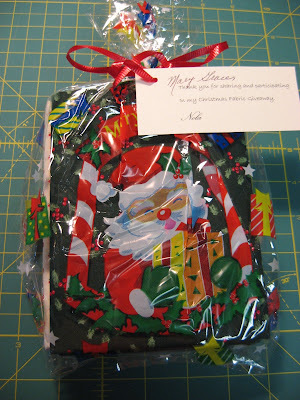 I had won one of the prizes she offered during the Fall into Fall Giveaway and here it is! 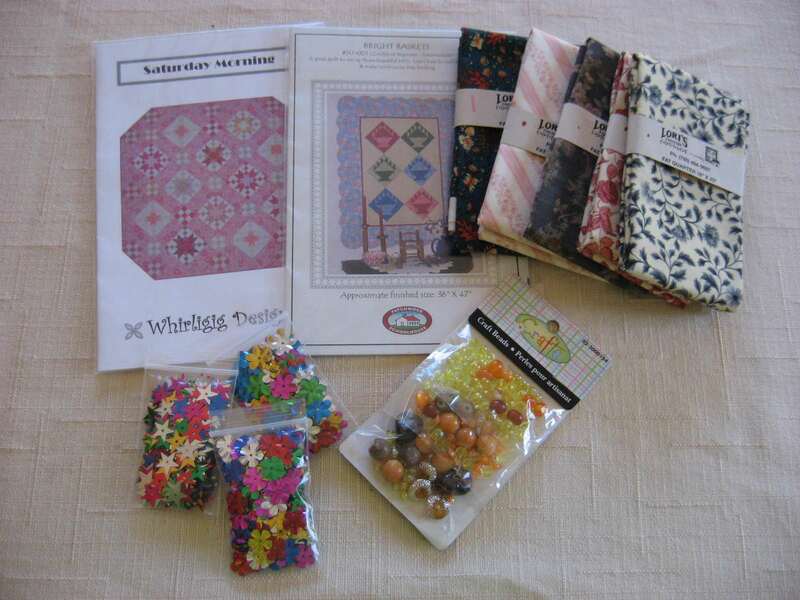 Five beautiful fat quarters, two patterns and some beads and funky sequins for crafts. Thanks Christine! Whew! I think perhaps I should think about purchasing a lottery ticket soon! Have you won any exciting prizes lately? Oooohh! Lucky you! You'll have fun with these! 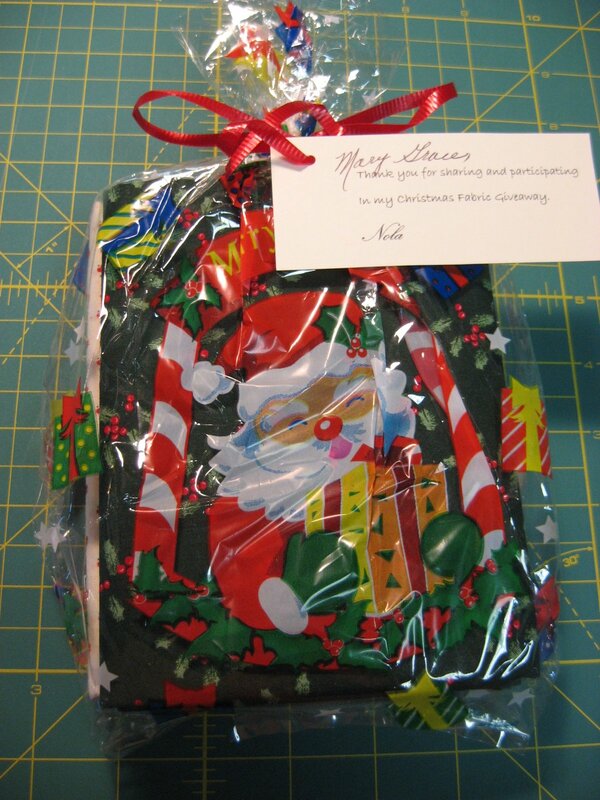 Wow - how lucky you are - I know how thrilled I was when I won one of your giveaways. You will have so much fun with all this fabric! Oh... you are so lucky! Have much fun with your fabrics. Good Morning: Yes, I was a winner at my Thimbleberries club this past week. 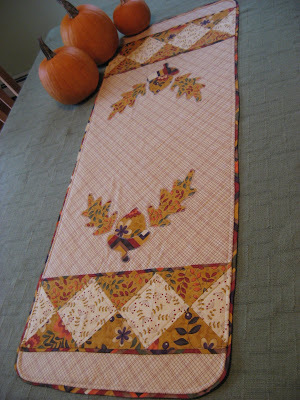 I won: 5 fat quarters, one table runner (Halloween style), one unfinished thimbleberries quilt top, one finished table topper - thimbleberries, one quilt pattern, I think that was it. Which was quite enough, made me extremely happy. "lucky" must be your middle name! Congrats! How wonderful! Congrats on all your wins. You are very lucky indeed--maybe you should buy a lottery ticket! What wonderful prizes. Enjoy all of them!